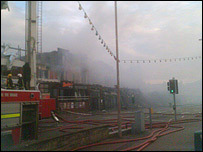 More than 100 firefighters have tackled a blaze which destroyed an arcade, pubs and shops at a coastal resort. Emergency crews were called to The Parade in the centre of Skegness, Lincolnshire on Thursday night. Flames swept through the buildings, forcing the collapse of a 200-metre long stretch of property. Police said the fire was being treated as suspicious but could not rule out an accidental cause as investigations were at an early stage. The fire could be seen more than 20 miles out to sea and water from nearby swimming pools was used to put out the flames. The blaze centred on the Lucky Strike arcade and The Parade, which is made up of four large entertainment bars - including Buster's Fun Pub and The Complex - and a number of concession stalls such as sweet shops and takeaways. Some of the businesses had been recently re-developed and modernised and others had been in existence for about 100 years. Simon Nash, incident commander for Lincolnshire Fire and Rescue, said: "We have a deep-seated fire still occurring in the heart of the complex and it will take some time to damp it down. "Because the roof has collapsed it has made it very hard to get to the heart of the fire." He added: "Some of my colleagues have said they have never seen anything like it." The town was still packed with tourists and revellers when the fire broke out. Office worker, David Smith, 19, said: "I was having a drink with some friends near the parade complex when police and bouncers came in and said we had to evacuate the building. "We were told it was a small fire so we weren't really worried about it. "But within 20 minutes the flames were sky high. We were all quite shocked. "It's really going to affect the nightlife because the parade is such a big part of that. "I think the holidaymakers are going to be a bit shocked when they come down." The derelict Parade Hotel, which sits behind the modern arcade, was so badly damaged it is due to be demolished. Businesses have said the incident comes on top of a poor tourist season already suffering after weeks of bad weather. Geoff Barry, spokesman for the Bowler Brothers, who had been developing many of the buildings which have been destroyed, said: "It's all gone. It's absolutely devastating. "It was a major business venture that the town had embraced. "Just two or three weeks ago they had completed the first phase and only earlier this week they were planning a major opening in September on a spectacular scale and all of that has gone." The secretary of the nearby ex-servicemen's club, Fred Hoyles, said the fire had gutted some premises which had been there for 100 years. "It looks like a bomb has hit the area. There are these bits of brickwork standing on their own and lots of twisted metal," he said. "I am very upset. I've lived here for years and it's hard to see the town in this state." Police have appealed for anyone who saw any suspicious activity in the area before the fire to come forward. Ch Supt Russ Hardy, said: "As the fire is unexplained, we are at this stage treating it as suspicious. "There are a number of possibilities we are investigating and these include the possibility that it is accidental as there are a number of catering establishments in the vicinity. We are also investigating the possibility that the fire was caused deliberately."